Work together to create greater impact – many stakeholders saying the same thing, being trustworthy and role models. Collective change and innovation is best supported through the facilitation of joint learning and coordinated action among a variety of stakeholders in and around a more or less permanent platform. 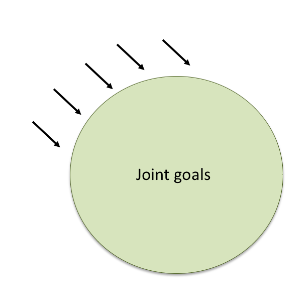 All innovations require, and are constituted by, changing patterns of coordination between independent actors. It follows from this that “adoption too” involves simultaneous and coordinated changes by a variety of actors (male beekeepers, women beekeepers, traders, beekeeping equipment- and transport companies etc.) , with different actors adopting different interconnected sub-innovations. The central purpose is to serve the beekeepers. The system is highly simplified and don’t take in account entities such as government, private sector, markets etc. It is not one system which makes the communication effective but several of the supplement each other. 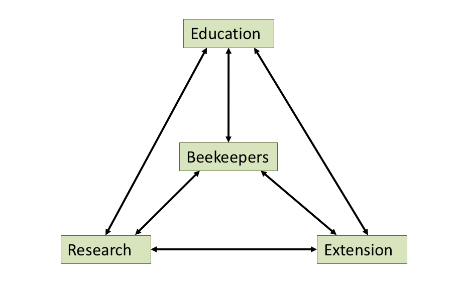 Two way communication between research and the beekeepers is seen as policy instruments to promote beekeeping development. Multiple stakeholders can when well organised and closely linked provide valuable expertise to accomplishing development. Who will be responsible for which areas, and for what purposes? Commitment to pluralism is central to discussion on extension reform.